Much to everyone's surprise, the monetary policy committee (MPC) of the Reserve Bank on Friday kept the repo rate unchanged at to 6.50 per cent in its fourth bi-monthly monetary policy review of 2018-19. Repurchase rate, or repo, is the rate at which the RBI lends money to commercial banks in the event of any shortfall of funds. Consequently, the reverse repo -- the rate at which the Reserve Bank borrows money from commercial banks within the country -- stood unchanged at 6.25 per cent. The central bank changed the policy stance to 'Calibrated tightening' from 'Neutral'. Calibrated tightening means rate will be maintained or hiked in this cycle. In its August policy meet, the rate setting panel headed by Governor Urjit Patel raised repo rate by 25 basis points to 6.25 per cent. The equity and forex market collapsed after the announcement. 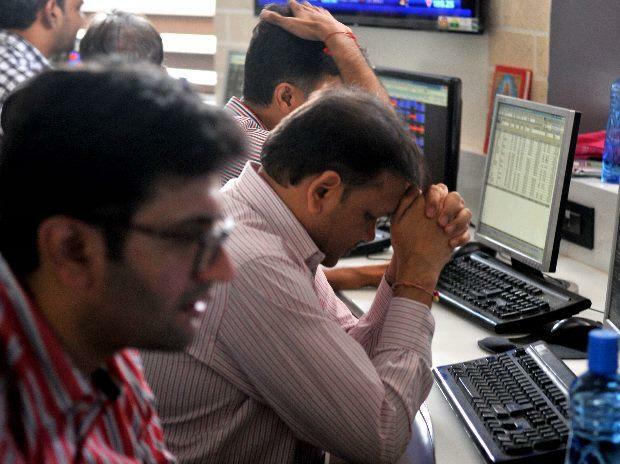 The S&P BSE Sensex was trading nearly 600 points down at 34,572. The NSE's Nifty50 index slipped below 10,400 and was trading at 10,394, down 205 points. The S&P BSE Sensex lost 792 points, or 2.25 per cent, to settle at 34,377 while the broader NSE's Nifty50 index dropped 335 points, or 2.7 per cent, to close at 10,264. Reacting to the RBI's move, the rupee extended decline and breached the crucial 74 level for the first time to hit an all time low of 74.22. Among specific stocks, shares of state-owned oil & gas companies, including oil marketing companies (OMCs), are reeling under pressure falling by up to 29% on the BSE in intra-day deals. This was after the government announced that it will cut excise duties on petrol and diesel prices and OMCs will absorb Re 1 per litre. The government also cut the excise duty on petroleum products by Rs 1.50 a litre with immediate effect. This is the first time in over four years that prices of either petrol or diesel are being controlled. Among individual stocks, Bharat Petroleum Corporation (BPCL) tanked 29% to Rs 239, while Hindustan Petroleum Corporation (HPCL) and Indian Oil Corporation (IOCL) plunged 25% each to Rs 165 and Rs 106, respectively. Oil and Natural Gas Corporation (ONGC), Oil India and Gail (India) have skid in the range of 14% to 20% on the BSE. All these stocks were trading at their 52-week lows on the BSE.